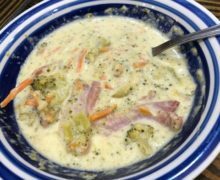 Have you ever had one of those days when you aren’t sure how you are going to get home after a crazy day of work/kids/carpool/life and make something your family will eat? While I have kids who will eat about anything, there are plenty of nights I wonder how I’m going to feed my family before they have to be asleep! I have the perfect meal for you! And in this case, I didn’t even make it! My 14 year old daughter had supper prepared for the family while I was trying to get home after a crazy day of work. 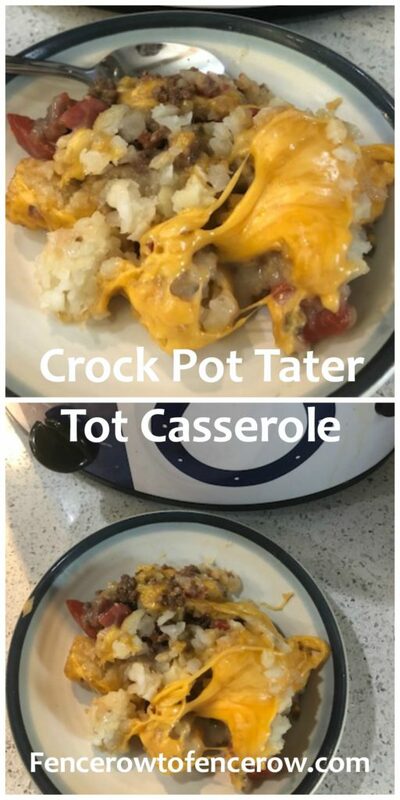 Enter Crock Pot Tater Tot Casserole. It may not be a gourmet meal. Or maybe it reminds you of your college days when you couldn’t afford to buy expensive groceries, but it’s a meal everyone in your family will eat! 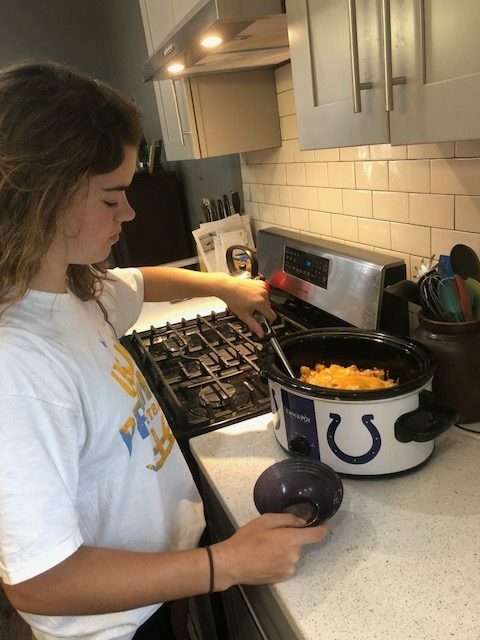 It’s also a meal you could make on a nice fall afternoon, while watching your favorite family member play youth football, run a giant cross country meet that takes all day, or plays in a volleyball tournament that last for hours! Tailgating isn’t just done at college sports, it’s at plenty of youth events as well! Alexandra was thrilled to make this completely on her own. 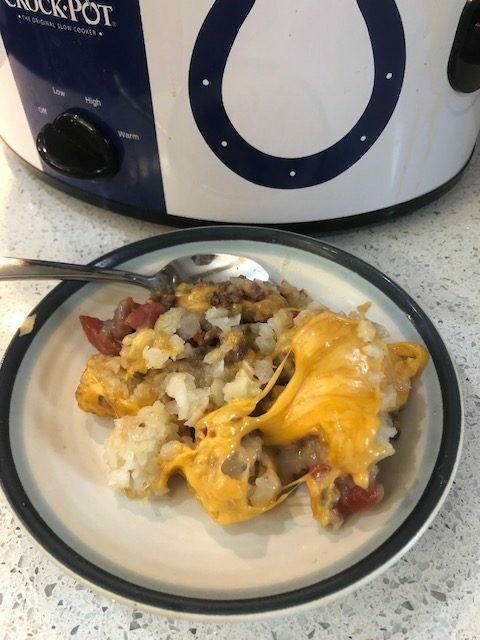 In fact, I was still at work when I called her, rattled off the recipe, and she assembled it in my favorite Colts Crock Pot. By the time the kids got done with their cross country and football practices, supper was done and I didn’t lift a finger. Thank goodness for kids who jump in and help! Brown the ground beef and drain well. Or place the beef on a paper towel-lined plate and pat to absorb extra grease. 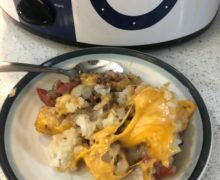 Place half the tater tots into the bottom of a Crock Pot that you have sprayed with nonstick spray. Cover and cook on low for 5 hours or high for 3 hours. In the last half hour of cooking, spread the shredded cheese over the entire top layer of tater tots. Replace lid and continue to cook until cheese has melted. This meal reminds me so much of something my roommates and I ate in college! Brings back fun memories! 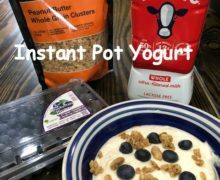 This fall, when my Farmer is in the field during long hours of corn and soybean harvest, this is one easy meal I can take to him or quickly feed my kids. What’s your favorite meal to take to your kids sporting events? I’d love to hear about it! ?? There’s no ground beef in the ingredient list.